I just got back Monday evening from a wonderful long weekend in Denver, during which my second cousin got married and his parents threw a big party the next day to celebrate multiple events, including their 35th wedding anniversary. It was a wonderful holiday, during which I was able to spend quality time with both Beau and with many family members who I rarely see. Beau and I kept our bodies on Eastern time for most of the trip, so we were up early every morning, without much to do. I used the time to catch up on my reading, and I finally finished the last of the Princess Series! If you remember back a few weeks ago, I reviewed the first two books of the Princess Series, The Stepsister Scheme and The Mermaid's Madness, by Jim C. Hines. 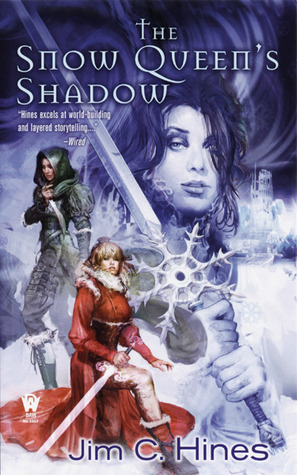 Today I will conclude the all-too-short series by reviewing the last two books, Red Hood's Revenge and The Snow Queen's Shadow. Roudette’s story was a simple one. A red cape. A wolf. A hunter. Her mother told her she would be safe, so long as she kept to the path. But sometimes the path leads to dark places. The princess known as Sleeping Beauty. Yeah, there's definitely a lot going on in this book, but it's still as kickass as its predecessors. A broken mirror. A stolen child. A final mission to try to stop an enemy they never dreamed they would face. When a spell gone wrong shatters Snow White’s enchanted mirror, a demon escapes into the world. The demon’s magic distorts the vision of all it touches, showing them only ugliness and hate. It is a power which turns even friends and lovers into mortal foes, one which will threaten humans and fairies alike. And the first to fall under the demon’s power is the princess Snow White. This is the bittersweet conclusion to the series. It did not end the way I expected. I might have definitely cried. And then I might have felt like hitting something, but I didn't go that far. 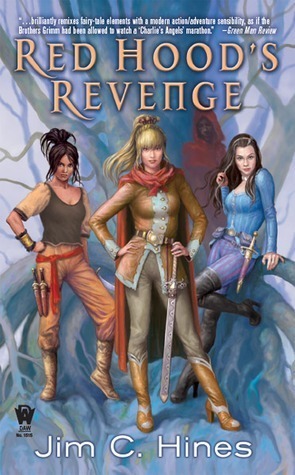 Just like the first two books focused on Danielle, and the third on Talia, this one focuses on Snow. Hines tells us more about her childhood and her wintery homeland, Allesandria. We also learn more about Jakob, Danielle's son, which was one of the most interesting revelations in the book. (And also why I hope Hines returns to this series one day). Without trying to give away much of the plot, what really struck me with this book were the ethical questions I asked myself. The demon affects anyone it touches, and those people all turn on the princesses, fighting them, trying to kill them. So much bloodshed occurs in this book, but unlike in the previous novels, when the enemies "had it coming," I felt very unsettled by the "enemies" injured and killed. And it made me think about soldiers who fight for their country, even if they don't always agree with what they're doing. I've become more and more of a pacifist in my old age, and this book partly reaffirmed that. Anyway, the four books are all brilliant, and as happy as I am to have read them, I'm sad the series is over. The ending is certainly fitting, and I understood why Hines ended it on this note, but I was still very sad about it. I just really like happy endings, with everyone alive, and paired off in love. But that only happens in Disney movies, not in brilliant adaptations of fairy tales. Once again, I'm linking up for Book Club Friday! I'll have to check these out!! Thanks for linking up! The series is so good! I highly recommend them. glad you had a series you loved! i've been a slacker in the reading dept. i read a book two weeks ago, and that was it. I read 51 new books last year, just short of my goal to read one new book a week. I'm way behind for this year, but I have a week-long vacation in September planned with Beau's family. Fingers crossed I can catch up then! I'm pretty sure my husband read these books. I remember him telling me about a princess fantasy series that he thought I would like, and I'm guessing these have to be it. Now I guess I just need to actually find where he put them, so I can read them myself. They're so good!!!! You definitely need to read them.